We’re delighted to see Faughs Minor Camogie team reach the County Final after only our second year competing in Minor Competitions. 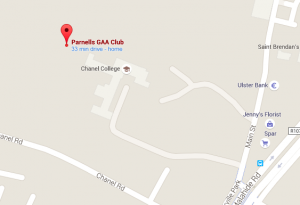 The match is on Sunday afternoon at 2.30pm in Parnells GAA Club. Just click on the Map below to get directions to the pitch. The girls need as much support as possible. We hope you can make it!